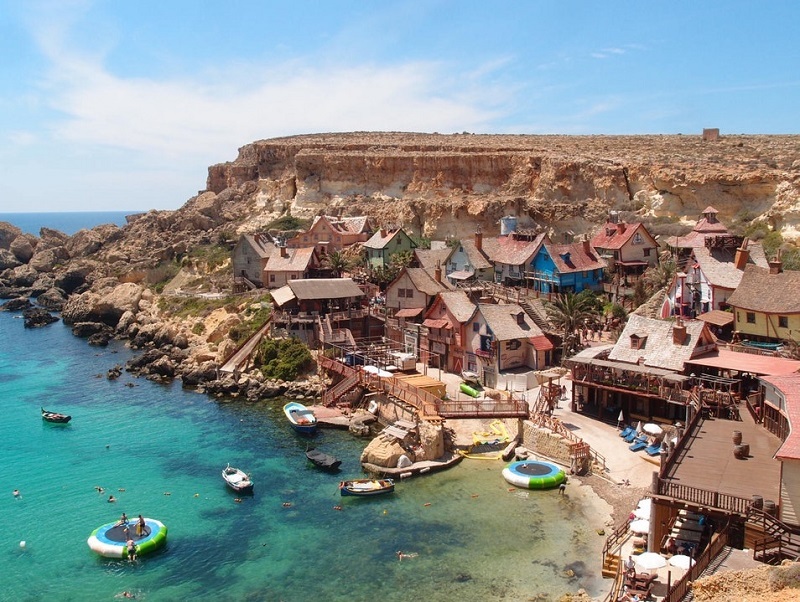 Popeye Village is the perfect place for families and groups to visit while in Malta. It contains parts of the original set of the film Popeye, along with numerous activities and entertainment suitable for all ages. The village turns the fictional world of Popeye into reality with interactive shows, exciting play areas, detailed museums, and explorable buildings inspired by the film and cartoon. Characters from the show are constantly walking around engaging with guests and even running special activities like karaoke. Anchor Bay, where the village is located, is a beautifully clear and blue body of water, and guests have the opportunity to swim, play on water-based structures, and take boat rides out into the bay. Anchor Bay, like most of Malta’s inlets, contains a pristine body of water that is light blue and clear enough to see the ocean floor. During summer, guests are able to swim and play on the water park, which among other games includes two trampolines and two inflatable platforms that launch people into the water. For a more relaxed approach to Anchor Bay, the village provides 20-minute boat rides around the bay in an old-styled boat. Boat trips are a great time for photos or just relaxing on the calm water. The Rough House provides a large indoor and outdoor area for visitors to eat, drink, or just relax on the deck with great views of the bay in front. Inside there is plenty of seating available and television screens that play the movie Popeye on a constant loop. This is a great place for guests to put their feet up before tackling the rest of the amusement park. You may also recognise this building as the ‘Cafe’ in the film. Popeye Village regularly holds interactive and very entertaining shows throughout each day that usually include characters from the movie and cartoon. These shows can include puppets, singing and dancing, and plenty of audience involvement like undergoing experiments or asking characters questions to solve mysteries. There are also special events held throughout the year such as the wedding of Popeye and Olive. The shows are held in different locations around the village including outside on the village’s streets. This is where visitors can meet the main character of the show and be transported into his world. Popeye’s Cabin provides an intimate experience with Popeye, listening to his stories and seeing how he lives. The accurately designed house and Popeye’s antics provide everyone with an immersive experience that is hilarious and fun. The Nautical Schoolhouse takes a step away from the wild and wacky side of Popeye Village, teaching guests about nautical topics. Anyone who steps inside will learn about the different nautical knots and how to tie them, what various words like port and starboard mean, and other sailing information that can be used when out on the water. It’s a nice educational addition to the amusement park. Within Popeye Village there are numerous buildings and props that were used in the film Popeye. Fans of the movie will enjoy seeing and visiting the same areas as the characters. Although some of these buildings are occasionally temporarily closed for repairs, they still provide interesting film history. The two buildings that house Popeye comic and film memorabilia and information are located next to each other. Bluto House, named after Popeye’s nemesis, contains detailed information about the film and unique pictures from the set that include Hollywood actors. Popeye Comic Museum displays the original Popeye comics from the 60’s, 70’s and 80’s. Visitors can see where Popeye started and how much the franchise has grown over 50 years. The Winery has various wines available for purchase, but also free tastings. It’s in a great location looking out at Anchor Bay, so if you want to relax with a glass of wine and an ocean view this is the perfect place to do so without spending any extra money. When the kids are out playing on the waterpark, parents can keep an eye on them and relax at the same time at the Anchor Bay Lido. The lido has sun beds that look directly out at the bay. The types of activities and entertainment available at Popeye Village vary throughout the year. Summer includes more water-based activities, while winter includes a lot of Christmas themed entertainment. It’s recommended to visit the village during summer for a much more lively and varied experience. 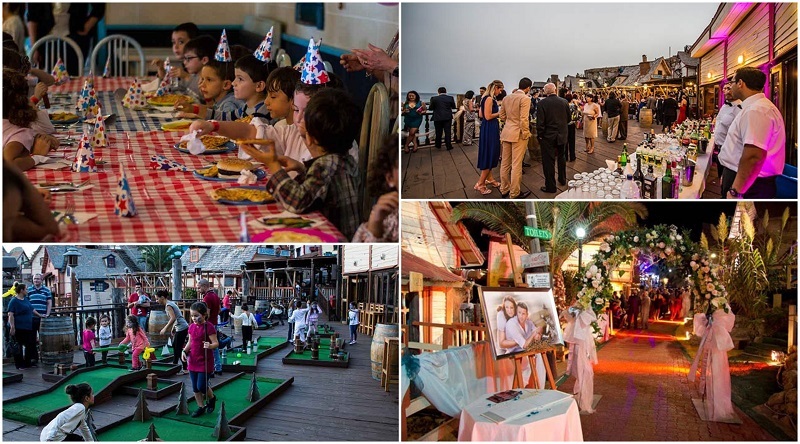 Popeye Village often has special offers regarding birthdays, weddings, food, and activities. These change regularly, so check their official site before visiting to see if any apply to you. Buses running express to Popeye Village pick-up people directly from their hotels from 9am-10:15am. Valetta (9am), Sliema (9:15am), Bugibba (9:30am-10am), and Mellieha (10:15am) are the locations where the bus runs through. Reservations must be made by calling +356 2152 4782 3 4 and passengers need to be available for pick-up 10 minutes before schedule. Express buses also drop visitors back to their hotels. They leave Popeye Village at 4:30pm. Bus The easiest and most cost-effective way to reach Popeye Village is by using the various bus lines in Malta. Catch Bus 42 from Valletta, Bus 221 from St. Paul’s Bay, Bus 222 from Sliema or St. Julian’s, and Bus X1 from the airport. Disembark at Tunnara stop in Mellieha Bay and walk 150 metres to Tunny Net. A shuttle bus runs hourly from Tunny Net to Popeye Village. 1-day bus tickets cost €2.60 and 7-day bus tickets cost €12.00. A small fee is charged for the shuttle bus. Alternatively, to save you from all the hassle of figuring out transport, you can arrange a hotel pickup package. Popeye Village was originally the set of the film Popeye. Construction of the film set commenced in 1979 and took 7 months to complete. After filming was completed the set remained and was later transformed into the amusement park Popeye Village. 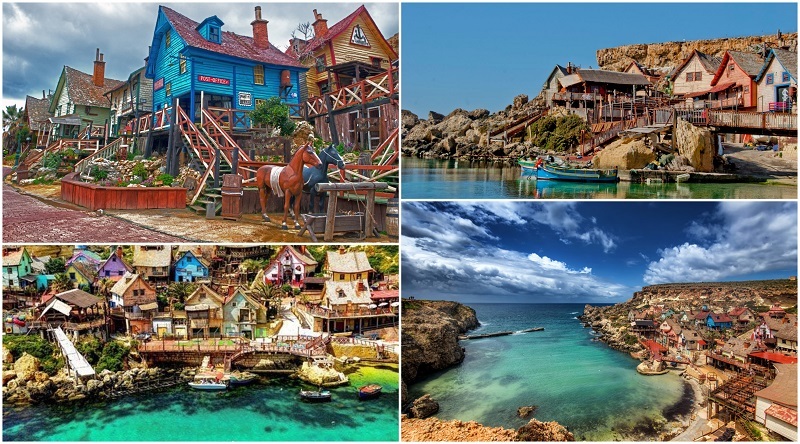 Popeye Village contains twenty authentic wooden buildings created for the film. Popeye Village is also known as Sweethaven Village as this was the name of the fictional village in the film.